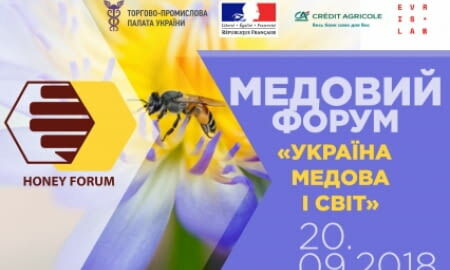 "Ukraine – the Land of Honey and the World"
On September 20, 2018, the Ukrainian Chamber of Commerce and Industry in partnership with the Embassy of France in Ukraine and with support of the Kyiv Regional State Administration will hold the autumn business forum "Ukraine – the Land of Honey and the World". Official partner of the forum - Credit Agricole Bank, one of the most reliable and stable banks in Ukraine, a key financial partner of agribusiness in Ukraine; legal partner – “Evris” law firm, a professional modern company with corporate principles of building business processes. The forum will serve as a modern communication platform for discussing acute issues related to production and marketing of Ukrainian honey. We invite to participate in the forum beekeepers, producers of beekeeping products, honey exporters, managers and representatives of public associations, academics, experts, equipment manufacturers, successful entrepreneurs – all those who are interested in this subject and further economic development of Ukraine. institutions, leading French experts in the field of beekeeping and honey production. The event will consist of 2 parts: a plenary session: "Ukraine – the Land of Honey. Together We Are Building Our Positive Image in the World" and a practical panel discussion: "Beekeepers - from Amateurism to Efficient Business. Experience of France» in which leading French experts will share their experience. CAN WE VIEW THE IMPOSITION OF MARTIAL LAW IN UKRAINE AS FORCE-MAJEURE CIRCUMSTANCES (CIRCUMSTANCES OF IRRESISTIBLE FORCE)? Over the last few days, immediately after the announcement of the Decree of the President of Ukraine "On the imposition of martial law in Ukraine" enquiries have been coming to the Ukrainian Chamber of Commerce and Industry and its regional chambers as to whether the UCCI can certify force majeure circumstances (circumstances of irresistible force) in connection with this situation. Fastiv City Council made a decision to organize and conduct a competition for selection of managing company of Industrial park “Fastindustry” in Fastiv city. The anti-crisis center specialists will consult business suffered from cyber attacks and help to prevent possible cyber threats in the future. Registration for event ""Ukraine – the Land of Honey and the World""